Hello again, Don Milne here, your ROADTRIP-'62 ™ traveler. We’re on the second of our journeys through time and place, traveling US-6. We’re at Chatham, Massachusetts, one day out of the eastern beginning point at Provincetown. We’ll be heading west, using the roads of 1962, both the Mid-Cape freeway and the old road now known as MA-6A. I'll be driving on this virtual roadtrip, but if you see anything you like, I encourage you to get out on the road and enjoy it in person. This virtual roadtrip may be fun, but there's nothing like the real thing! At any time, click on an underlined word below to learn more about the places on the trip. Time for me to grab the wheel and go! We’re making an early start today, to get to the docks on time. We’ll be going off-road, taking a whale-watching cruise out in the Atlantic Ocean! We could have sailed from Provincetown yesterday, but we didn’t have enough time to do everything in one day. I’m headed to Barnstable Harbor on the north side of the cape, for Hyannis Whale Watcher Cruises. They’ve been here a long time, over 30 years, which may make them the oldest whale cruise here. But the whales were here long before 1962, and I’m sure someone would sail you out to see them, so we’re not going to miss this show. Hyannis has experienced naturalists providing expert narration throughout the trip, adding knowledge of whale feeding habits, and even identifying individual whales they’ve come to know! Because a cruise takes 3½ to 4 hours, I took the earliest one, leaving time to spend on other things later in the day. The ships pass by Provincetown and head to the Stellwagen Bank National Marine Sanctuary in the Atlantic Ocean. On a good day, the whales come right up to the boat, both swimming alongside and breaching the surface as they feed. You can’t resist walking from side to side of the ship to make sure you don’t miss anything on either side! There are three species of whales that are commonly seen here. The smallest is the Minke whale, and the largest is the Finback. Most of the show belongs to the Humpback whales though, which were constantly near the ship on my cruise. Sea gulls and other sea birds flock to the areas where the whales breach the surface, to feast on the fish that are stirred up, adding to the viewing fun. I should mention too, that if you’d rather see seals than whales, there are some seal viewing cruises from the south side of Cape Cod, traveling to the Monomoy Island National Wildlife Refuge. The refuge was established in 1944 to benefit migratory birds, so we could have enjoyed bird-watching in 1962. Anyway, it’s time for lunch after we return. Let’s look around Yarmouth and Hyannis and see if we can discover something from my favorite year. Less than 2 miles east and right on old US-6 is Hallet’s Ice Cream, serving from the fountain counter since 1889. It’s the oldest family-owned, operating soda fountain in the US. Hyannis has so many restaurants that there must be several that were here in 1962, even if they’ve changed names. One that hasn’t changed names is Baxter's Fish 'n' Chips, opened in 1957. It’s unusual because it is built entirely over the water! They serve a Cape Cod must have, fresh seafood, and you have great views of the harbor activities from the tables on the deck. It even has a historical connection to 1962, as President Kennedy sometimes ordered seafood from Baxter’s back then. Instead of getting back on the road, I’m wandering around Hyannis a bit. If you need to do some tourist shopping, this is a great place. As with the restaurants, at least of few of the stores were probably around since 1962, though I haven’t been able to spot any. Something that was not here back then is the John F. Kennedy Hyannis Museum. Kennedy was still president in 1962, and frequently stayed in the Hyannis at the Kennedy family summer homes. The museum features over 80 photographs showcasing John F. Kennedy, his family, his friends and his experiences on the Cape. The photographs span his entire life from 1934 to 1963. There are also oral histories from the president’s life and a video narrated by Walter Cronkite. When I was last in town, I watched the Fourth of July fireworks from the hill behind the museum. It’s a great view of the harbor where the show was launched. Thought the museum wasn’t open in 1962, there was another way to do your Kennedy watching. Hyannis Harbor Tours began in that year specifically to fulfill a public demand to view the Kennedy Compound. The owners of Scudder & Taylor Oil Company had obtained a piece of land at the north end of the Ocean Street Docks as payment for an outstanding bill. They bought a tour boat and their 3 person operation has now grown to 350 employees! The renamed Hy-Line Cruises provides deep sea fishing charters, ferrys to both Martha’s Vineyard and Nantucket, canal cruises out of Onset Harbor, and Harbor Cruises in Hyannis. If we wanted to stay another night on the cape, we could take the Cape Cod Central Railway to Sandwich, our next destination. It would take another night because by the time you got back to Hyannis, you would use most of the day. Up until 1959, you could take a train from Boston or New York to Hyannis. There was no year-round passenger service between 1959 and 1986, when Amtrak began running trains again. Even that service has ceased, but tourist day trip service has been available sporadically under different railroad names since. Today the Cape Cod Central Railroad provides both scenic and dinner trains. The same tracks used in 1962 pass cranberry bogs, sand dunes, and historic villages, roughly paralleling US-6. Speaking of cranberry bogs, commercial cranberry growing in bogs was begun just east of here, in the Dennis area we drove through this morning. Cranberries are one of only three fruits native to North America. They grow in the wild on long-running vines in sandy bogs and marshes. The Native Americans of this area harvested the wild berries and early settlers copied their practices. Today, the Wampanoag Tribe in Mashpee still harvests the old way in October on Cranberry Day. Eventually, by the late 1800s, farmers created specialized tools and cultivation methods for mass harvests. Farming boomed and the Ocean Spray cooperative was formed in 1930. The company is a farmers’ cooperative, and has grown to more than 600 grower families all across North America. 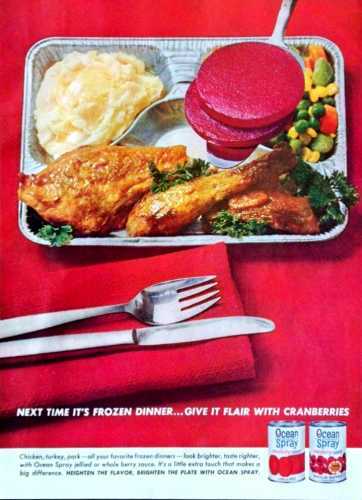 For many years, the familiar products of jellied cranberry sauce and Cranberry Juice Cocktail dominated their sales. Even innovations such as Cran-Apple Juice didn’t appear until 1963. Heading west on old US-6, we pass the historic West Parish Meeting House in West Barnstable, Massachusetts. The Meeting House is a Congregational Church constructed in 1717, and last restored between 1953-1958 so we see the same structure now as we would have in 1962. The congregation still worships in the Meeting House. It houses a bell cast by Paul Revere; yes that Paul Revere. His business was metal working, including castings and silversmithing. As with most of the Revolutionary Army, he volunteered to fight to create our country. Our current armed forces is also a volunteer army; people who believe strongly in the concept of freedom embodied by the United States. An ancient cemetery adjacent to the building has headstones dating back to Colonial times and is a pleasant place to walk in quiet reverence for the hard work and courage of the settlers and founders of our country. As we drive, I’m sure you’ve noticed that hydrangeas grow particularly well on Cape Cod! The Cape Cod Hydrangea Society celebrates these big, beautiful, blue flowers with help on growing them. They also host a hydrangea display garden at the Heritage Museums and Gardens in Sandwich, Massachusetts. While I was most fascinated with the blue blossoms, hydrangeas also bloom in white and various shades of pink. The color is determined by the acidity of the soil. Highly acidic soil produces blue flowers, neutral soil produces white flowers, and alkaline soil turns the flowers pink. They flourish here due to the combination of moist, misty air and sandy soil. Some people have described Cape Cod as a hydrangea heaven and I have to agree: you see them planted everywhere! Other places with great hydrangea displays are the Atlanta Botanical Garden in Atlanta, Georgia; the Memphis Botanic Garden in Memphis, Tennessee; Dromoland Castle in County Clare, Ireland; the Royal Botanic Garden in Edinburgh, Scotland; the demonstration garden of the Belgian Hydrangea Society in Destelbergen, Belgium; and Woodleigh Gardens in New Zealand. The Heritage Museums and Gardens has been open to the public only since 1969, so it doesn’t fit our schedule. However, much of the collection showcases items from before 1962, including a fun exhibit of kitchens through the years that has some items from our period. The nearby Sandwich Glass Museum has been here for over 100 years, so let’s enjoy that collection! The museum is a great place for viewing the history of post-colonial glass. Glassmaking was an important industry on the cape but not because the raw material for glass is sand! Beach sand is actually too impure to make glass; that requires pure quartz silica. The Boston & Sandwich Glass Company, first to set up a glass factory here, shipped in pure silica supplies from New Jersey, New York, and Massachusetts. Sandwich was selected for the factory site because of its shallow harbor and the possibility of a canal being built through Cape Cod that would connect it more directly to the New York and Philadelphia markets. The canal was eventually constructed and we’ll cross it tomorrow at Sagamore, Massachusetts. The availability of timber as fuel for the glass furnaces was also important, and local salt marsh hay and grasses were a bonus that could be used for packing material. The museum collection includes mold-blown, pressed, cut and even engraved glass. Most is from the period 1825-1888, when the Boston & Sandwich Glass Company operated here. Other firms in the area continued with smaller scale glass manufacturing. By the 1920s, the entire glass industry in Sandwich had ended and the factory buildings were slowly demolished. By 1944, there was barely a trace of any buildings. The local historical society later created the museum and besides their collection you can now watch glassmakers blow glass by hand at the furnace and purchase souvenirs. I enjoy glass as art and visited another glass museum on my US-23 roadtrip, in Fostoria, Ohio. Another company, Pairpoint Crystal, is still producing glass in nearby Sagamore. They’ve been making glass since 1837 and are America’s oldest glassworks. They only moved to the Sagamore location in 1969, so they’re too new for our journey, but they also have glassblowing demonstrations if you’re interested. In the factory store you can find everything from Christmas tree ornaments to art for art’s sake. Sandwich is also the hometown of the author of the Peter Cottontail stories, Thornton W. Burgess. He started writing these about 1914, and you can learn more about him and his books at the Thornton W. Burgess Museum here. The museum was opened in this house on an old mill pond, not previously owned by Mr. Burgess, in 1976 by the Thornton W. Burgess Society. Mr. Burgess was still alive in 1962, though he was no longer publishing. He published his last book, the autobiography "Now I Remember", in 1960. Also that year, he published his 15,000th story in his syndicated daily newspaper column titled "Bedtime Stories". You can pick up a copy of his books at any library or buy them from Amazon; they’re still fun for reading to the kids. One museum that was open in 1962 is the Dexter Grist Mill, which was fully restored just the year before. The mill is right across the street from the Glass Museum and there has been a grist mill at this site since 1640. It uses authentic wooden parts and an undershot wooden waterwheel, with millstones imported from France. You can still buy cornmeal ground in the mill and when I visited the docent made sure to grind some while he talked. I was also fascinated by the fresh water spring on the property’s roadside. People actually bring plastic jugs and fill them! Now that the museums have all closed, it’s time for dinner and a last walk on a Cape Cod beach. Sandwich has a pleasant beach at the north edge of town, known as Town Neck Beach. Parking is tight, but your climb over the dune from the lot will be rewarded with a long, sandy beach. Nice place for a picnic if you bought some goodies in town. Sit and listen to the sea awhile, take a walk along the beach, or cross the marsh on a boardwalk for a more unusual hike. Well, it’s getting late and no campfires here tonight. So let’s hunt for an old motel. We passed the Sandy Neck Motel on old US-6, about five miles back: that looked old enough and has rooms decorated "...with olde style Cape Cod Charm." The Earl of Sandwich Motel and Country Acres Motel look similar and are both closer to town. The older properties on Cape Cod generally appear well maintained, which may be due to high occupancy: this place gets very crowded in summers! I’ll be watching some TV tonight. We’re close enough to get a signal from Boston’s WGBH, an early educational channel and later home to Sesame Street. And if this were 1962, we might be lucky enough to watch Julia Child’s first television appearance. She was appearing on a book review show, demonstrating and talking about her book Mastering the Art of French Cooking, which had been published the year before. In 1963, her signature show "The French Chef", began and the world of cooking and television chefs would change forever. Or I might just watch the Donna Reed Show and catch Shelly Fabares singing "Johnny Angel." A dreamy little song from 1962 that I think is just perfect for Cape Cod. Good night, and I’ll see you tomorrow at ROADTRIP-'62 ™ , back on the road.